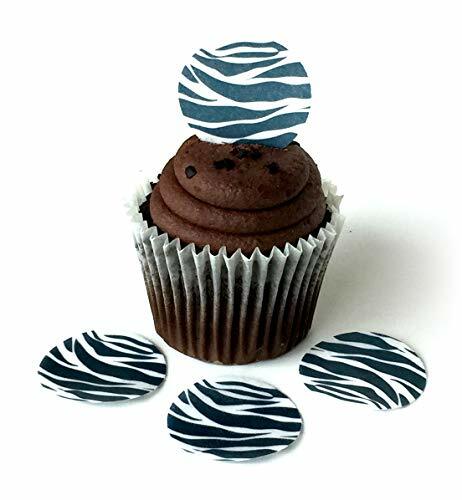 Zebra Animal Print Black White Wafer Paper Toppers 1.5 Inch for Decorating Desserts Cupcakes Birthday Cakes Cookies Pack of 24 by Deco Machine Toppers at Animal Backgrounds. Hurry! Limited time offer. Offer valid only while supplies last. These toppers make your desserts come to life! Product is 1.5'' (One and a Half Inch) Diameter. Color/Design: You will receive toppers as pictured. If you have any questions about this product by Deco Machine Toppers, contact us by completing and submitting the form below. If you are looking for a specif part number, please include it with your message.